Convert images between all key formats such as JPEG, PDF, RAW, TIFF, TGA, RAS, GIF, JPEG 2000, animated GIF/PNG, etc. Automatically resize your photos to popular printing formats. Automate routine work using ready conversion templates. Protect your images with personal watermark. AVS Image Converter is a part of the AVS4YOU package. Register once and use all tools from AVS4YOU.com. Subscribe for $39/year or $59/lifetime. Please contact us with the contact form to report difficulties, strange behaviors or persistent problems, and quote the program name or the number 22028 . Convert and save tons of images between such formats as JPEG, PDF, RAW, TIFF, etc. Use Batch mode to speed up the conversion process. Apply correction settings to improve images quality. Select among various effects and watermark converted images. This is the download page for AVS Image Converter - Convert your pictures, improve their quality and look, apply various effects, copyright converted images. It is easy and fast with AVS Image Converter. 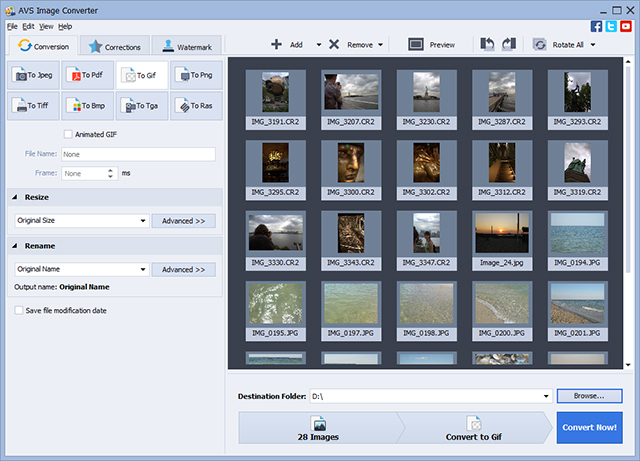 Convert tons of images to all key formats in one go! Work with such formats as JPEG, PDF, RAW, TIFF, TGA, RAS, GIF, JPEG 2000, animated GIF/PNG, etc. Convert and save your images in PDF-format. Apply auto-correction settings to improve images parameters such as brightness and contrast. Automatically resize your photos to popular printing formats with AVS Image Converter. Prepare your images for future slideshows that you can upload to popular websites. Select between various effects - make your pictures look like black-and-white pics, or old faded photographs. Select a logo or write a phrase and apply it to all converted pictures as a personal watermark. Work with piles of images more efficiently thanks to a command line mode. Set such everyday tasks as conversion between various formats, resizing, watermarking pictures using customized presets. AVS Image Converter is a part of the AVS4YOU.com package. Register once at avs4you.com and work with all tools from the AVS4YOU.com package. Subscribe for $39/year or $59/lifetime. AVS4YOU tools let you easily rip, convert and edit audio/video files, edit images, burn DVDs, create ringtones, upload videos to portable devices, players, phones and much more!